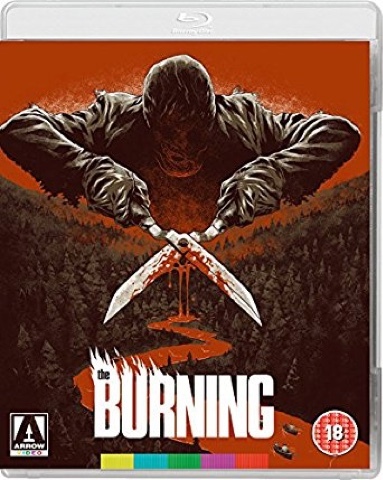 The Burning finally gets a DVD and Bluray release in a dual format next week from Arrow Films. Although released a few months ago on Steelbook, it was only limited to a few thousand copies, and these are selling upwards from £45,00 to even higher on Internet auction sites at the moment. Another one of the banned nasties in the UK throughout the eighties from a meddling government who decided they knew best in the form of censorship, and what the BRITISH public could see or not. Thankfully with a change of management in the nineties at the BBFC, and a more liberal government, we finally got to see these beauties, on VHS of course at the tail end of the nineties. With the releases of The Exorcist, Evil Dead, The Bogeyman, Texas Chainsaw Massacre, Driller Killer, Suspira and many others deemed to graphic for the British public in the eighties. Stupid really as these films seem tame in comparison to modern horror, you only have to see Martyrs to see how far, and how sensible censors or these days, compared to the days of old. Anyway this release has the same special features as the Steelbook, and comes dual format including both DVD and Bluray version of this great 80's slasher. FIRST PRESSING ONLY: Illustrated collector s booklet featuring new writing on the film by Justin Kerswell.